Right ventricular pacing lead provides critical pacing in situations of life-threatening brady-arrhythmias – hence from a purely rhythm maintenance point of view, the most critical lead of a pacing system is the right ventricular lead. 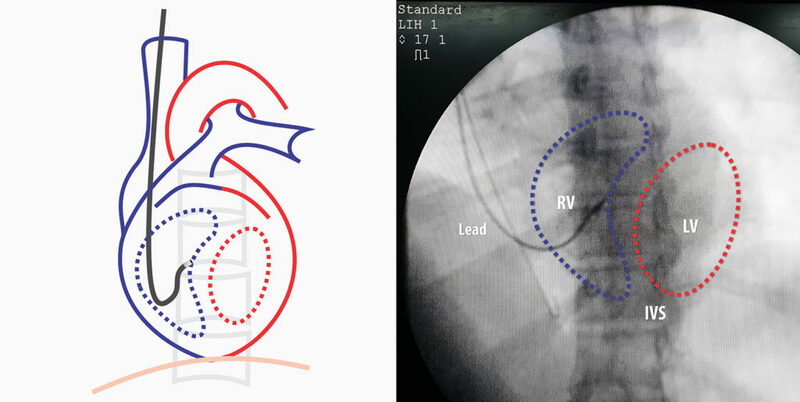 As discussed in the previous section, there are two methods of implanting an RV lead : Apical implantation and septal implantation. 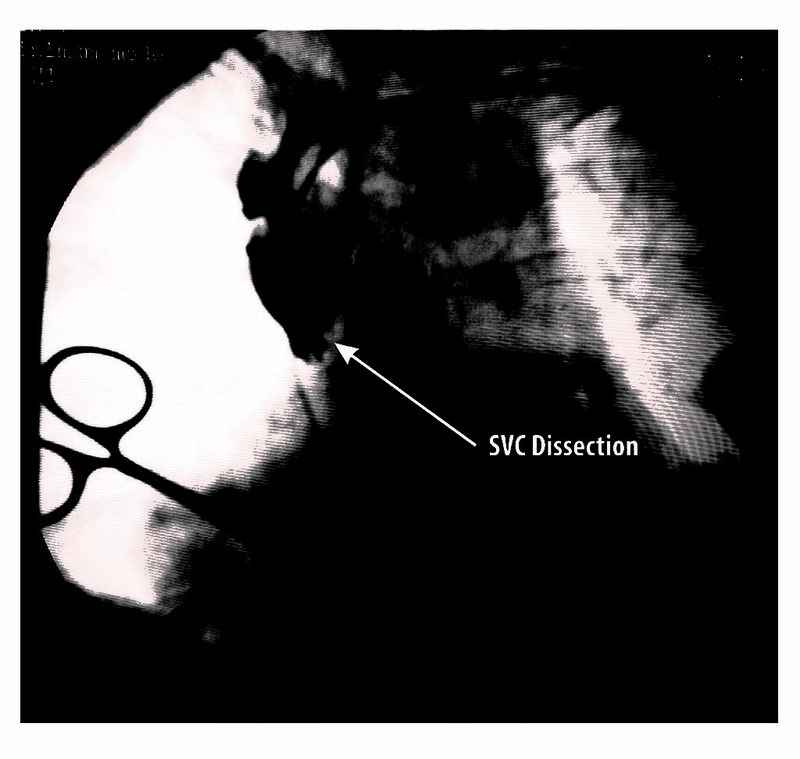 The technique of septal implantation is described here. The author’s default preferred method is septal pacing. The goal is to achieve a narrowest possible paced QRS complex with acceptable lead parameters. 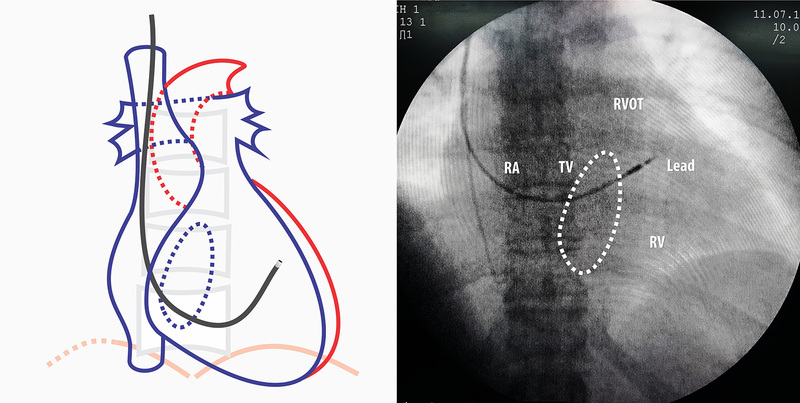 Therefore a combination of radiographic and paced ECG mapping is utilized to get to the ideal mid-septal position. Although the lead is usually 6Fr thick, it is an extremely floppy structure compared to other coronary and vascular catheters. This floppiness facilitates placement of the lead in challenging positions during implantation and after implantation free movement of its body within the vascular space. The downside of this floppiness is that, lead placement requires the use of stiff metal stylets to guide the lead to the desired position. The active fixation ventricular lead pack comes with several metal stylets of varying hardness and they are usually straight ones but some contain a J shaped stylet in addition to straight ones. 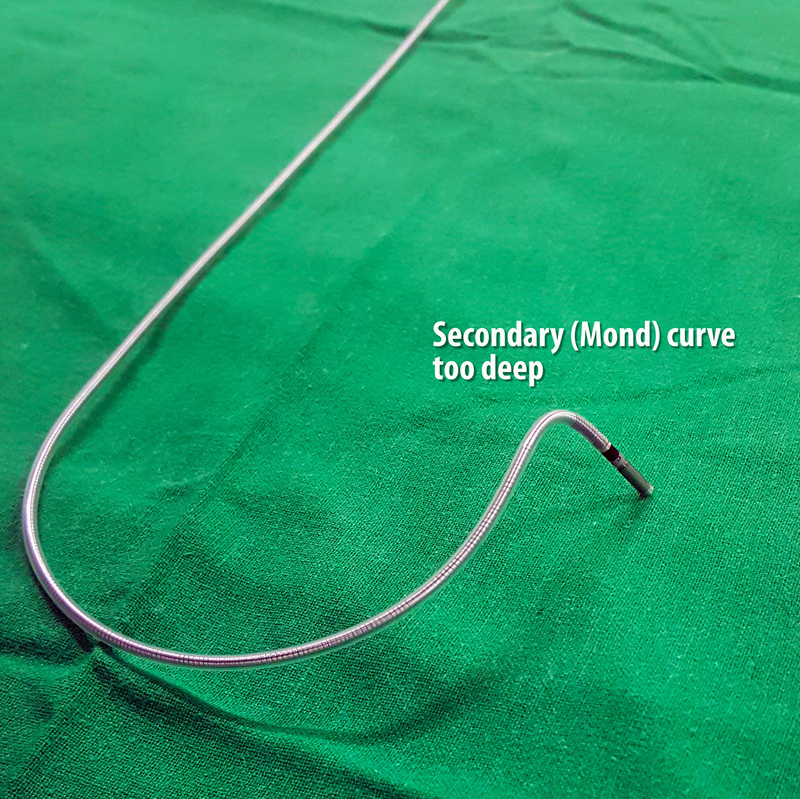 This J curved stylet can be used to facilitate lead crossing through the tricuspid valve. Manipulating the RV lead through the tricuspid annulus requires dexterity, thoughtful approach and most importantly patience. A gently curved stylet as follows which conforms to the RV cavity can facilitate crossing the TV. 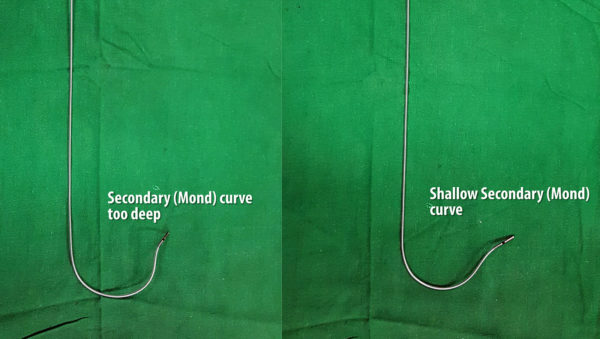 Our preferred approach is to make a three dimensionally curved stylet and use it to guide the lead because in vast majority of cases valve crossing and correct lead placement can be achieved in a single pass using this stylet. The stylet that is used to guide the lead to the mid septum has two curves : The first large curve facilitates crossing the tricuspid valve aiming upwards towards the RV mid cavity (instead of the apex) and the small curve at the end makes the lead point towards septum instead of the free wall. If one takes time to appreciate the shape of the stylet in anatomical orientation it’s extremely easy to figure out its usefulness. 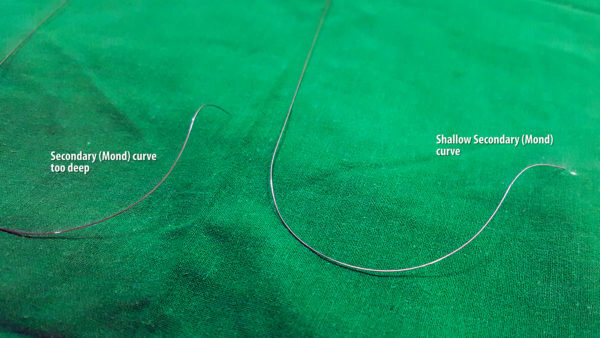 The curves are constructed by drawing a pre-wetted (heparinized saline) straight stylet over wet gauze swab or artery forceps as demonstrated below. 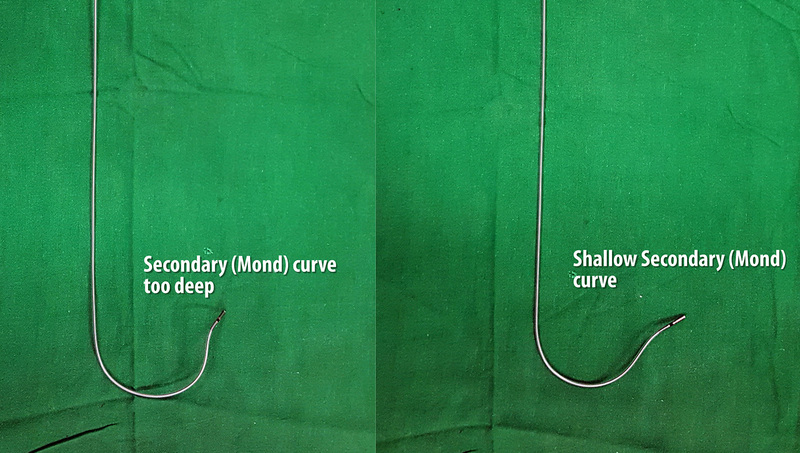 Figure : Deep distal curve. Note how the distal curve would place the lead tip almost perpendicular to the septum. Although this looks nice on LAO radiography while implanting, once the stylet comes out, the tip just hangs by it’s screw. A more shallow curve would wedge the lead obliquely rather than perpendicular – which means there is more tissue to hold the lead tip in place. Once you are ready with a curved stylet, the lead implantation can begin. The foremost step is the insertion of the lead via the sheath. For this, the sheath dilator and guide-wire are gently pulled out and the lead is inserted through the lumen of the sheath.The lead should go in about 1/3 of its length without any resistance but its always better to check furoscopically as to where the lead is. It is very important that the lead be advanced slowly and not forcibly. Never pull out the guidewire blindly (without looking through fluro) if there is a temporary pacing wire giving critical pacing support. The distal curved part of the guide-wire can get entangled in the temporary wire and dislodge it from the RV leading to loss of capture. Video : Removal of guide-wire and insertion of lead through sheath. Important steps are to prevent air suction and to insert gently without force and using fluroscopy. 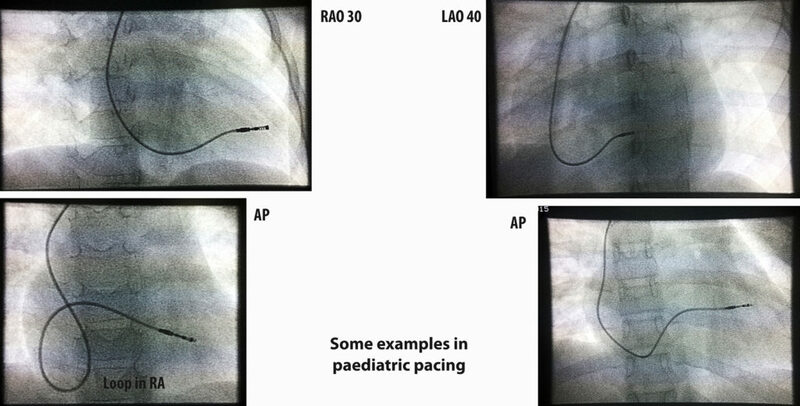 Figure : Complication of lead insertion – This patient was supposed to have an upgrade to dual chamber pacing. (She was already on a AAI pacemaker). After vascular access, although the guide wire went in easily, the lead was struggling at the SVC / RA junction. After some overzealous attempts, the new lead was seen to get “stuck”. This lead was carefully removed and contrast was injected through the sheath which revealed the frightening sight of a potential SVC dissection. Fortunately, it resolved on its own and the procedure was abandoned for a future date pending detailed vascular assessment. 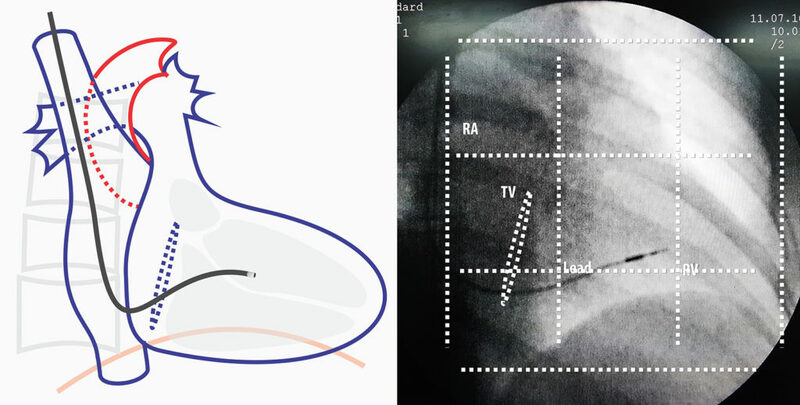 In AP projection the RV free wall is most anterior and the septum lies behind it with RV cavity separating the two. Because of the oblique rotation of the heart, it is necessary to appreciate that the inter-ventricular septum seen in AP projection is actually foreshortened and one cannot get an accurate idea of the distance from the tricuspid valve to the Apex (i. e. the horizontal length of the septum) – Therefore we need the right – anterior – oblique (RAO) view to get an idea of the true longitudinal width of the inter-ventricular septum. At RAO 30 degrees, the shadow that we see is a good projection of the septum. 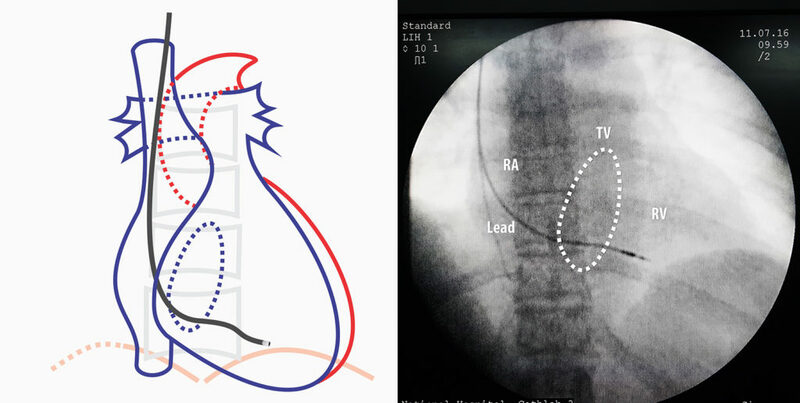 Therefore the mid-septal position where we place the lead is decided while viewing in RAO 30. 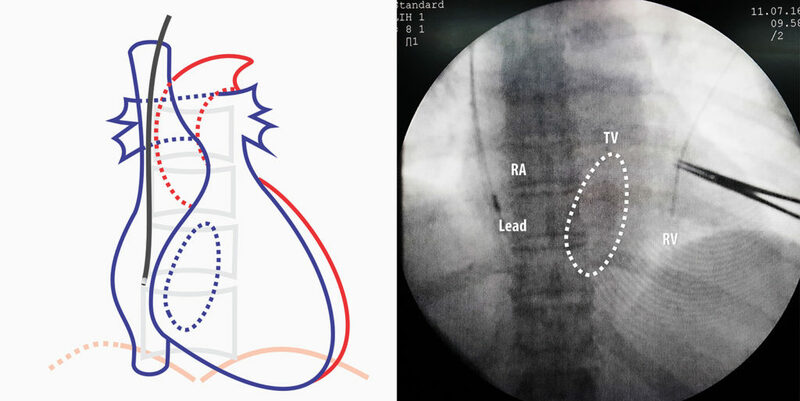 Determination of Optimal Site : First is to use fluoroscopy. In this technique, one divides the RAO cardiac shadow in to three equal vertical and three horizontal sections. The horizontal sections are produced by dividing from the spinal edge to lateral cardiac border (apex). The vertical sections are divided by taking the upper and lower limits of the cardiac shadow. The following diagrams illustrate these sections. The optimal radiographic site is the middle third in both directions. With experience, the marking can be done mentally with eye balled limits but out of the boundaries, upper and lower limits are the most variable as diaphragmatic shadow can obscure inferior cardiac border. Anatomical variations and body habitus also play a role. 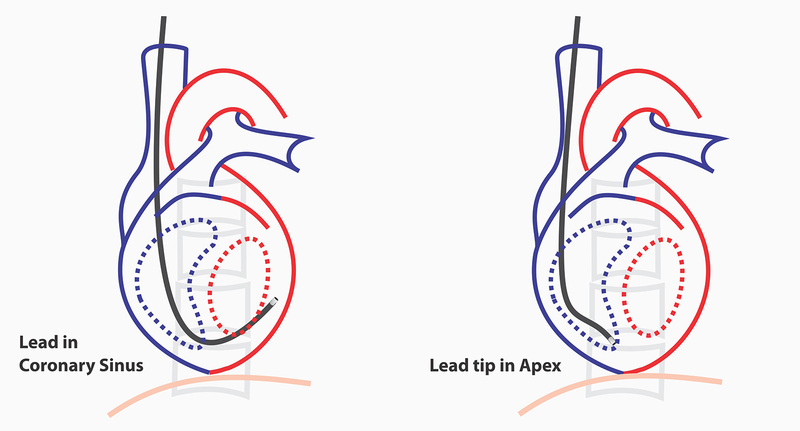 At times, it is difficult to get to the mid septal position as the lead tends to gravitate into the apex. 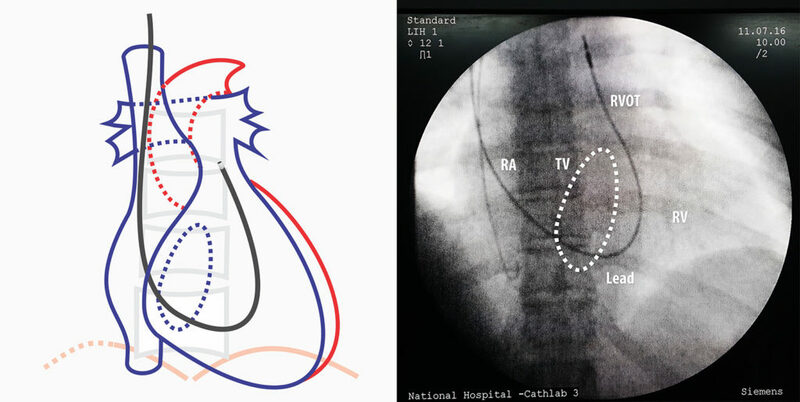 In such instances, the RVOT drop-down method can be utilized facilitate septal positioning. With the straight stylet almost halfway withdrawn, the operator can try to wriggle the floppy lead into the right ventricular outflow tract (which is aided by the blood flow). Once well in the RVOT, the straight stylet is exchanged with the 3D stylet and the lead is slowly withdrawn under fluroscopy until the tip “drops” to the septum. In certain situations, low septal pacing may be better than mid septal pacing. The apical location has one undeniable benefit – lead stability. Generally an apical lead does not slip out and is very stable – which may be a consideration where critical pacing is necessary (e.g. elderly patient with life threatening complete heart block) more than “physiologic pacing”. Septal leads have a relatively higher chance of early dislodgement and therefore the author’s current practice (after some bad experience !!) is to pace the low anterior septum in elderly or otherwise frail patients whose rhythm is totally dependent on pacing. The second situation where low septal pacing is preferred over mid septal, is when implanting ICD leads. If there is no long-term pacing need its better to implant in low septum as ICD leads are heavy and hence prone to more early dislodgement. 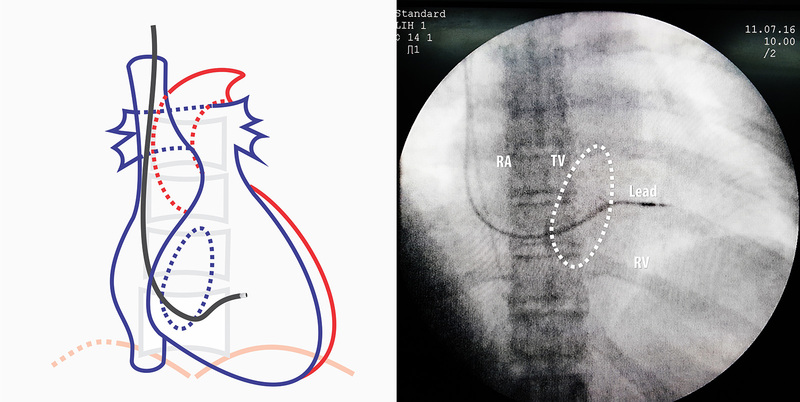 It is also assumed that low septal position give more coverage for the shocking vector of the RV coil. However in CRTDs, mid-septal pacing may provide better axis separation for optimal CRT response compared to low septal position. Figure : RAO 30 degrees view – Optional Sites . In certain situations these locations can be used. The low septum is particularly useful for ICD leads and in situations where lead stability is of critical importance (see text). At times, anterior septum is better electrically rather than mid-septal position. Occasionally, despite good radiographic position – one finds that the QRS complex is not narrow (aka ugly !) in the mid septum. Electrical mapping may show that the best site is way more anterior in the septum. If this is the case, that location should be chosen. However, one must be absolutely sure its anterior septum NOT anterior wall – therefore confirmation is essential in LAO view. Author has seen a case where a supposedly anterior septal lead was actually in anterior wall and subsequently migrated out. 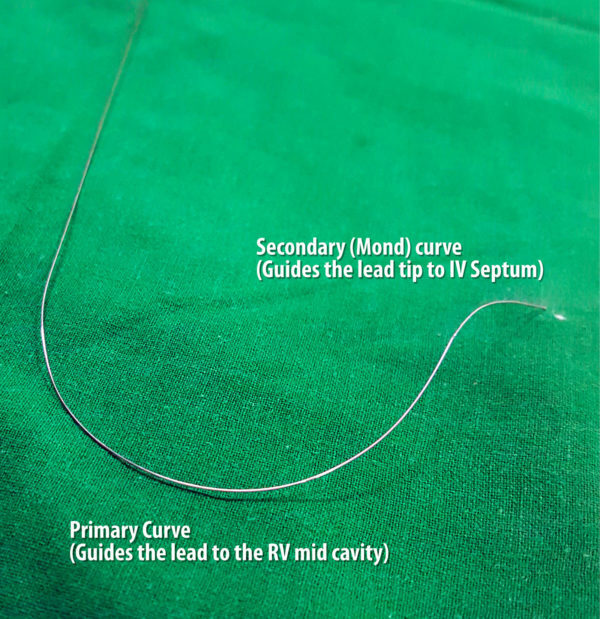 The limitation of RAO view is that one has no idea actually whether the lead tip (pointed by the second curve of the stylet) is actually facing the septum or the RV free wall. Although the paced ECG morphology would indicate a free wall position, this may not be the actual case and we need to verify that it’s indeed pointing to the septum – for this the, left anterior oblique view (LAO) at 40 degree view helps. In LAO projection, we are looking end on from the cardiac apex and on the right side lies the RV cavity and the left side lies the LV cavity along with the septum in between at the vertical midline. 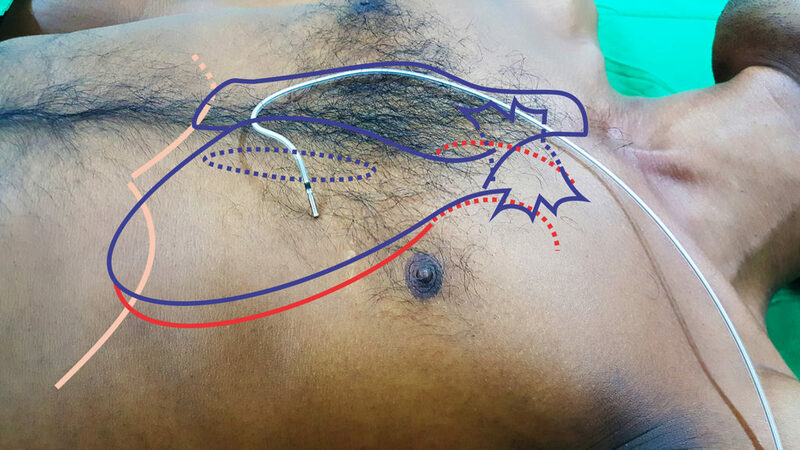 Figure – Using LAO 40 degrees view to confirm septal location. As demonstrated above, if the tip is apposed against the mid-line, then we are sure that it’s pacing the septum – not the free wall. Its best practice to confirm this view before deploying the active fix screw as a free wall fix can lead to a perforation. If the lead is seen taking curve along the inferior aspect of the cardiac silhouette (crossing the mid-line), then it has gone in to the coronary sinus and needs re-positioning. The other thing to consider in LAO projection is the acuteness of the lead to the septum (i.e. perpendicular vs oblique). 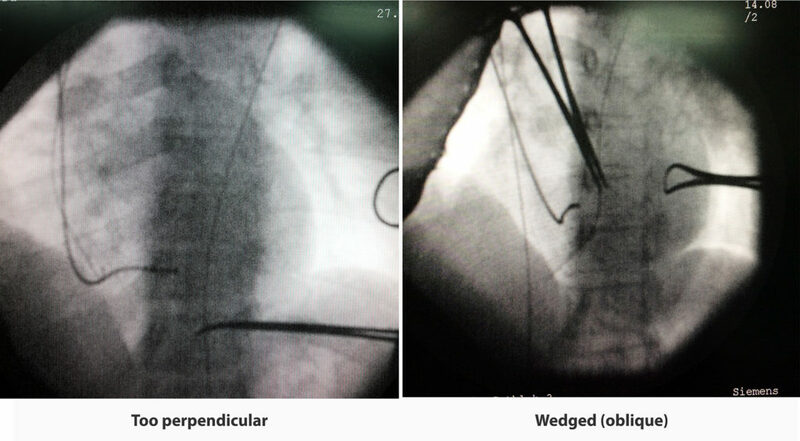 Oblique appearance suggest wedged attachment to the septal muscle. Wedging offers more lead stability which is the achillies heel of septal pacing. In perpendicular attachment, the lead is basically attached only at the screw.and may be hanging down form it. However, this positioning is decided by the second curve of the sylet and its impossible to adjust this while the lead is being positioned. Due to these reasons, the distal curve of the sytlet is now made to a gentle curve that facilitates wedging. Note : A recent retrospective study (here) showed disproportionately large number of children developing dilated cardiomyoaphthy after RV inlet pacing – it had not been defined as to what RV inlet is but it is assumed that its the proximal (~mid) septal position. How ever the numbers are small for a definitive conclusion. The paediatric pacing done at LRH, Colombo is being retrospectively analyzed for this problem and should shed some light as ALL trans-venous pacing done since 2007 (and being done) have been mid septal pacing. Although it has not been systematically studied so far in the LRH pacemaker recipients the problem should have manifested as the pacemaker children are regularly followed up and because nearly half in the above study population had developed DCM !!! Once the lead is in place one must pace and see the electrical result too – because certain ECG features are desirable for optimal pacing. Things to look for are the QRS width and QRS height / directionality in limb leads. Ideal paced QRS should be narrow as possible (looks similar to the native QRS if there is no bundle branch block) and should be upright in Leads I, II. Achieving a narrow upright QRS in lead I may be difficult due to intra myocardial LV activation in septal pacing. However II and aVF should be narrow without difficulty and should have dominant R waves. If these two leads do not have dominant R Waves (i.e. predominantly upright QRS), the lead should be re-positioned at a higher position to achieve such as the lead may be too low and close to the inferior cardiac border. 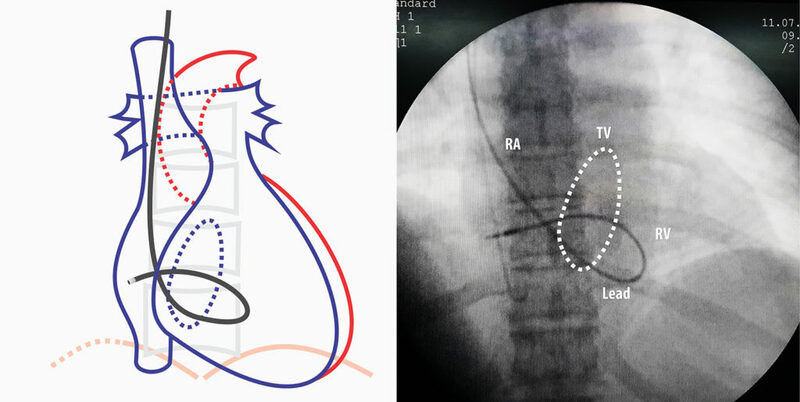 All re-positioning should be done in RAO view for optimal positioning and LAO confirmed before the screw is deployed. Upright QRS indicates top-down activation of the ventricles, similar to native conduction and a narrow QRS indicates that inter-ventricular delay is minimal. Despite optimal limb lead QRS complex, most of the time the precordial leads do show some hint of LBBB. This is because the although septal, the initial activation is from the RV. However this LBBB like look is very narrow when compared with the ugly LBBB resulting from apical pacing. Active fix lead deployment must be done meticulously and not hurried. The screw in mechanism must enter the myocardium in a similar fashion that a cork screw enters the cork. If the fluoroscopic system supports high magnification, one can visualize the screw being deployed but it’s not a must if you count the number of turns. The recommended number of turns for a RV lead is 10-15 but depends on the lead manufacturer. Once the screw has been deployed, the curved stylet can be taken out. The stylet should be gently but firmly pulled out – rapid pull must be avoided as that may dislodge the lead. 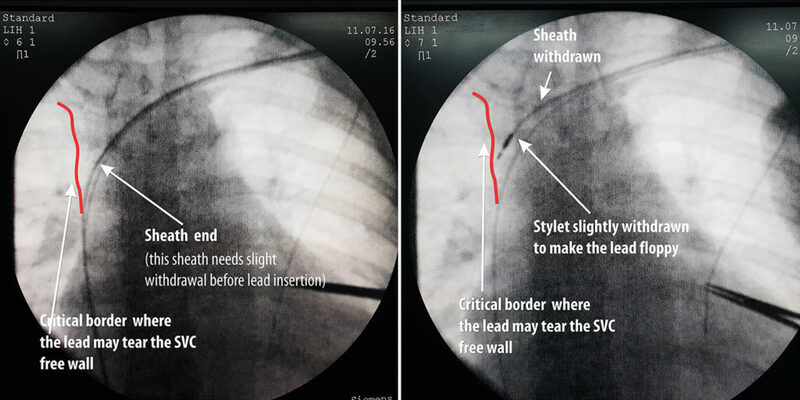 Removal of the stylet should be done under continuous fluroscopy as the wriggling movement of the lead during pull out is a surrogate marker for lead stability. Thereafter a straight stylet is placed in halfway along the lead. It’s imperative that only half of the stylet is put it – if full length is inserted, the distal part of the lead may straighten out and get dislodged. The sole propose of this stylet is to provide support of lead anchorage at the pocket. straight stylet is in place, the parameters are checked again for confirmation. Once the parameters are deemed suitable, the peel-away sheath can be now removed by pulling apart from its two “ears”. Once sheath is peeled away, you loose access to the vein and therefore lead parameters have to be perfect before the sheath is removed. Video : Active fixation of lead – Note how the lead is held straight during fixation and the counted rotations of the screw. (The screw attaches to the lead end with a snap). This is an instance where an assistant is invaluable – if no assistant is available, one has to rely on the stylet to keep the lead straight. Keeping the lead straight facilitates 1 : 1 transmission of torque. A tiny push (1 – 2 mm) once 10 rotations are complete helps embedding the screw into the myocardium. Brief glance of fluoroscopy is recommended to view the tip position and screw deployment. Thereafter the curved stylet is removed firmly but slowly under fluro, while observing the dangling movement of the lead. Static location of the lead tip despite dangling confirms good fixation. 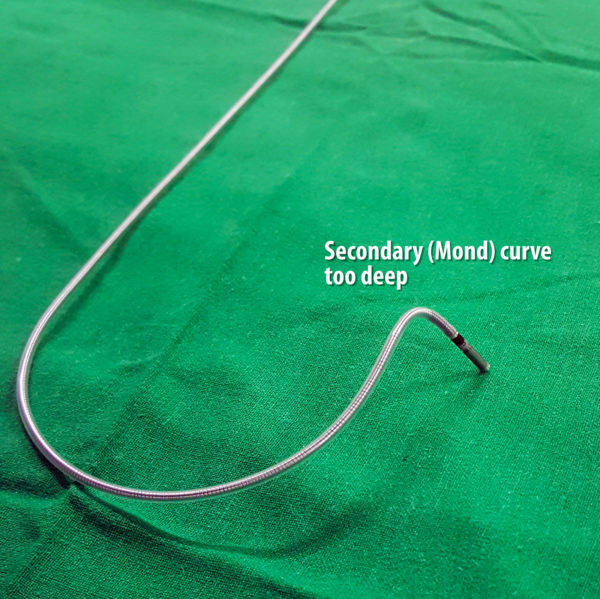 Once the curved stylet is out, a straight sytlet is inserted halfway into the lead. The role of this stylet is to provide stiffness to the vascular part of the lead to facilitate removal of the sheath and anchor the lead. It should not be sent in too much as it will straighten out the intra-cardiac part of the lead and cause a dislodgement. Video : Peel-away of sheath – Sheath peel away must be done as demonstrated to prevent a vascular tear while keeping the lead in place. When pulling from the “ears” of the sheath, the split on the shaft of the sheath may extend into the vein and tear the vein – therefore splitting point on the shaft must be visible externally. This can be done by slowly withdrawing the sheath as you peel away. The lead must be held in place with a finger while the sheath is – withdrawn. Figure – Final position of RV lead in AP view. Note the gentle curve (loop) of lead left in RA – this prevents tension on the lead tip that may occur when upper limb movements occur. It also gives some protection in case the lead sleeve loosens out.